RANGERS are still in with a fighting chance of reaching the knockout round of 32 in the UEFA Europa League after a goalless draw in their penultimate Group G match against Villarreal at Ibrox Stadium. Despite having Daniel Candeias controversially sent off just before half time, Steven Gerrard’s brave side battled throughout the second period to secure a valuable point against a La Liga outfit with so many quality players in their ranks. The result means the Light Blues now sit third in the table, a point behind the Spaniards and Rapid Vienna, who beat Spartak Moscow 2-1 in the earlier group fixture. Although a win was the target for Rangers this evening they will no doubt take a draw after going down to ten men and they might even have snatched all three points at the end with Villarreal goalkeeper Andres Fernandez pulling off a terrific save from substitute Kyle Lafferty’s powerful drive in the latter stages of a compelling contest. Allan McGregor also enjoyed a fine game and his two exceptional saves before the break proved so crucial. Gerrard made four changes to his starting eleven tonight with Jon Flanagan, Joe Worrall, Lassana Coulibaly and Alfredo Morelos back in following the weekend’s 3-0 victory over Livingston. As ever on these kind of occasions, the pre-match atmosphere at Ibrox was electric as the teams walked out onto the playing surface, with the home support vociferous and the Broomloan Stand producing a shimmering red, white and blue card display which read ‘Super Rangers’. The noise level remained the same as the action got underway and the first chance of the game fell to the home side with five minutes on the clock. A low cross from Candeias on the right found Scott Arfield but his snap shot was straight at Fernandez. Villarreal then showed their threat with Karl Toko Ekambi entering the 18 yard box on the right side and his drilled cross was inches away from the boot of the sliding Carlos Bacca. Rangers, however, were looking good in the early stages with the Ibrox faithful right behind them, while the visitors were producing a few uncharacteristic stray passes. On 21 minutes a run a deflected shot from Morelos went out for corner and the Colombian’s powerful, positive play had the fans out of their seats yet again. Rangers, of course, could not let their concentration slip for a second, and this was highlighted when Villarreal’s number nine Bacca cleverly turned Worrall and his cutback cross found unmarked Cameroonian Ekambi who sclaffed a shot wide of McGregor’s goal from eight yards. On the half hour mark both teams had guilt-edged chances to break the deadlock but neither could take them. A deep cross from Arfield found Worrall at the back post and the towering defender nodded the ball down to Connor Goldson who blazed a shot over the bar from a good position. In the next attack a clever pass sent Bacca through one-on-one with McGregor but the in-form Gers keeper dived to his left to make a wonderful stop to deny the lively Colombian. It was proving to be an intriguing battle between two good sides looking to attack at every opportunity, and Rangers again had McGregor to thank when a slack pass from Flanagan allowed Ekambi to skip through on goal. The Scotland keeper, however, put up a glove to make another outstanding save. Before the interval the game took a twist when Candeias, who had already been booked, was sent off. Slovenian referee Matej Jug clearly felt the Portuguese winger fouled Santiago Caseres after the midfielder was tackled by Morelos but the very debatable decision enraged the home support, and their anger could still be heard as the teams and officials walked up the tunnel for the half-time interval. With Candeias off Rangers switched to a 4-3-1-1 formation with Glenn Middleton supporting Morelos, but with a man down they clearly had it all to do in the second forty-five. McGregor’s heroics continued at the start of the second half as he saved a shot from distance before he slid out to get a hand to the ball after Ekambi had been released by an early pass. 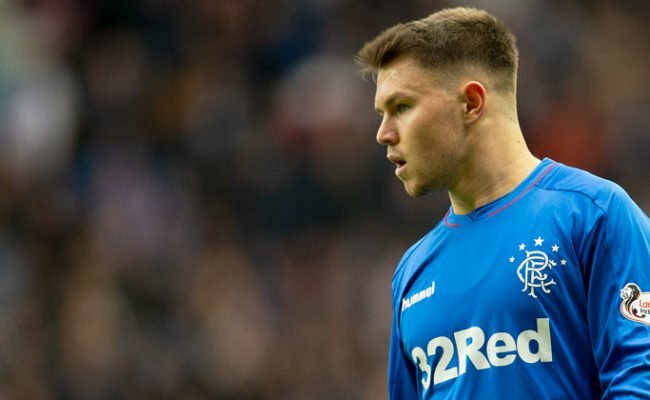 It was clear Rangers’ goalscoring chances would be limited and before the hour mark an ambitious shot long-range shot from Middleton, which went well wide, was a close as they came to troubling Fernandez. Javier Calleja was the first of the managers to change his team, with Santi Cazorla and Gerard Moreno going on to add fresh legs to Villarreal with plenty of time still to go. 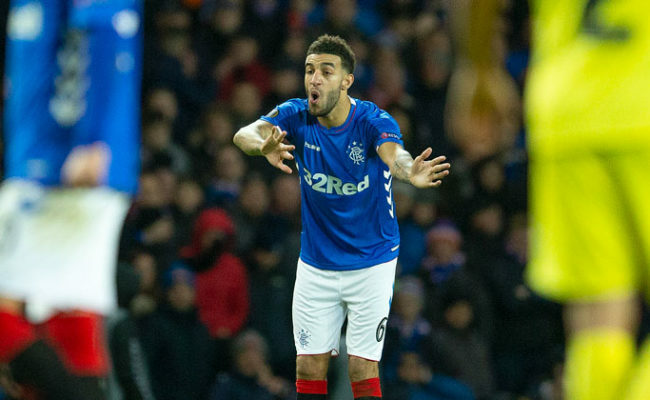 With the visitors knowing only too well that a win would guarantee their spot in the next round of the competition, they started to apply more pressure on the Gers’ organised backline, with Goldson playing a key role in the centre. On 76 minutes there was, however, to be heartache for the loyal Rangers fans as Tavernier sent a teasing delivery across the six-yard line and Middleton flicked it into the net off the post at the Copland Road end. Unfortunately, the nearside linesman raised his flag leaving the 18-year-old, and almost every person in the stadium, with their hands on their heads. Remarkably, Rangers were now shifting through the gears and Fernandez produced a wonder save to from substitute Lafferty’s 25 yard thunderbolt. It was a dramatic end to an entertaining game and despite not being able to get the win they craved, the Rangers fans applauded their heroes in blue, and deservedly so, when the referee blew for full time.